When it came time for my wife and I to go out on our first Date Night since having a baby, it seemed thematically appropriate for the outing to double as our third anniversary celebration. We’re both very efficient people. And as a bonus, because of the venue, every drink over the course of the evening would serve as a toast to not one, but several beginnings. Born and raised in the Bronx, Danielle and I moved to Connecticut two and a half years ago. As amateur foodies, we assumed that one of the biggest changes would be our lack of access to amazing food. When you live in New York City, or even right outside of it, you take the amount and variety of food at your disposal for granted; your “to visit” list only ever seems to grow. We agreed that a trade-off for the quieter, slower lifestyle that we wanted would be our sacrificing even needing to create such a list. To compare the Connecticut food scene to the New York City food scene is a fool’s errand. The two don’t operate on the same scale and they don’t have the same goals. And Connecticut will never have the same variety, nor the same volume; that’s just a function of the math of population density. But once you move past those realities, you find yourself face-to-face with an inspired group of people who love food, have access to great, local ingredients, and have a wide array of influences and cultures to represent. So we started a list. Had to. And for the most part, the list has only resulted in terrific meals. But my favorite restaurant, by far, since moving? My wife found Stanziato’s. She was looking for pizza because I love pizza. We love pizza. We love to make pizza and as our friends and family will attest, we make it pretty well. 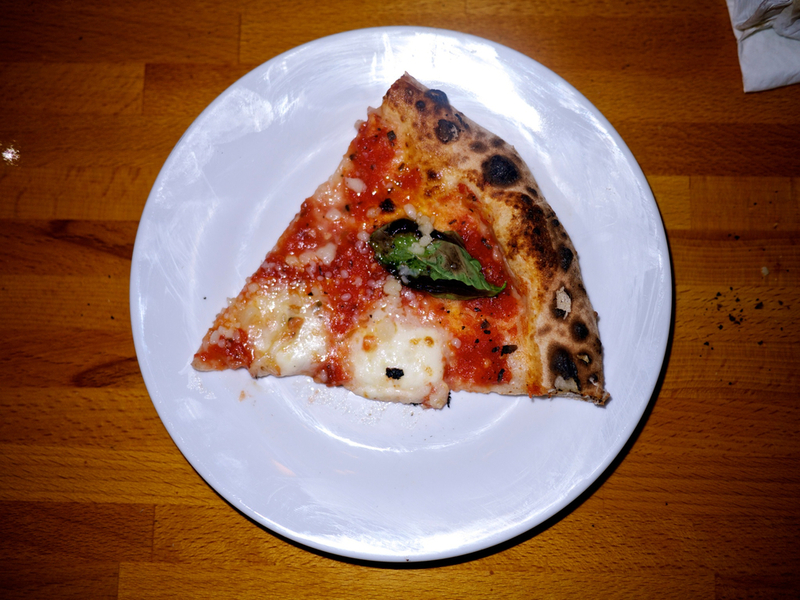 We love slice joint pizza and fancy pizza and Chicago-style pizza and everything in-between. 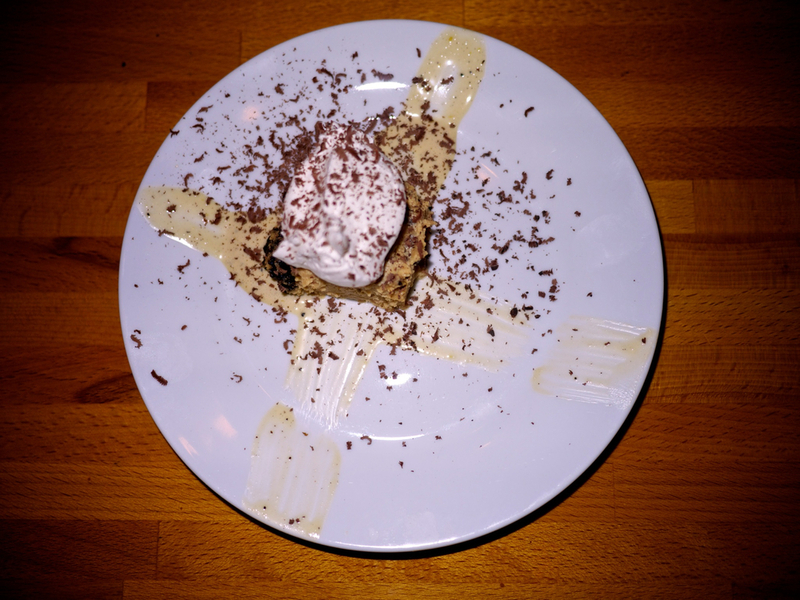 A while back, I found a great little restaurant in Sandy Hook, Figs Wood Fired Bistro, thanks to Slice, and while their pies are terrific, they’re not a pizza place, and while they make some great drinks, it isn't totally our vibe. If the essence of my personality needed to be distilled down and re-personified as a pizza place, the creation would look, feel, and function much like Stanizato’s. There is rough-hewn, pun-y, post-modern artwork on the walls. A hipster-riffic soundtrack plays over a proudly unhidden cobbled-together stereo. There is no pretension, only smiles, and a graffiti-style font is used in their signage. Their location is an unassuming store front, the interior space recently expanded. Oh, and they serve some of the best pizza I’ve ever had in my life. Defying all expectations of moving to the woods of Connecticut, Stanziato’s has become one of my favorite places to eat on the planet (a coincidence, considering they were voted the best wood-fired pizza in the universe). And so it was with great excitement that my wife and I attended their 2nd Craft Beer and Food Pairing on September 29th, 2013. Tickets were $65 each. All pictures can be (and should be) clicked to view in higher resolution. All course descriptions are per the above menu that was distributed that night. Whenever I go to Stanziato’s, the ‘Shroomz’ pie is one of my standby choices because they use some of the tastiest mushrooms I’ve ever eaten. Those mushrooms, combined with the earthiness of the truffle, and the familiarity of the sweet potato, all combined with the starchiness of the farro that had been treated as risotto, had both of us laughing at how good the dish was. The Munchner was a great pairing; I generally don’t care for unfiltered beers, but this was hearty and crisp. The grouper was a perfectly cooked piece of fish. As a kitchen wannabe, I always marvel at the production behind a plate. There were about 50 people at the event and the Stanizato’s kitchen’s predominant presence is the pizza oven. Where the crew was able to perfectly cook and plate 50 pieces of fish all at the same time is beyond me. But they did it. The succotash was nice and crisp and a good compliment, texture-wise. My only quibble was that there wasn’t enough of the cilantro, which made the two or three bites I had with it just perfect. Danielle liked the Baladin more than I did. I appreciated the paring though; the fish was, once again, a canvas for bolder flavors and the beer provided them. Danielle was quite pleased that she accurately predicted a sorbet as the surprise. The sour beer (and honestly, that’s about as much as I remember. The beer sommelier said that it was similar to a Flemish Red, but warned me not to write that it was a Flemish Red, for fear of uprising by the beer geek community) was really tasty. It had a refreshing, bubbly grape presence. I’ll admit that, as much as I (spoiler alert) loved the evening as a whole, I was maybe a little disappointed that every course wasn’t a pizza course. It goes without saying that both pizzas were awesome; this is, after all, Stanziato’s bread-and-butter. I love their red sauce, which isn’t thick or heavy, and they always seem to put just the right amount of mozzarella. The gorgonzola pie was similar to a pie I make at home and the best part of all of it? We wound up getting two slices each of each pie. The Estivale was my favorite beer of the night; just a perfectly crisp, hoppy beer that went perfectly with the richness and slight char of the pizza. This was my least favorite dish of the night. Part of the problem was that it wasn’t hot enough, though I’ll admit that I am one of those people who likes their food served burn-the-roof-of-your-mouth-off. Comparatively, Danielle thought the temperature was fine. The other issue was that the main elements of the dish—the braised chicken, the chickpeas, and the butternut squash—felt like individual components that just happened to be in the same bowl. Also, the butternut squash was served borderline raw (UPDATE—I was informed by Stanziato's that what I thought was butternut squash was actually carrot, which makes sense, considering the texture and size of the pieces), albeit sliced thinly, but it was just too jarringly crunchy for me. For a meal that had so much refinement, I thought this one felt a little kitchen meal-y to be the finisher. The Unibroue was the only beer of the night that I’d had previously. 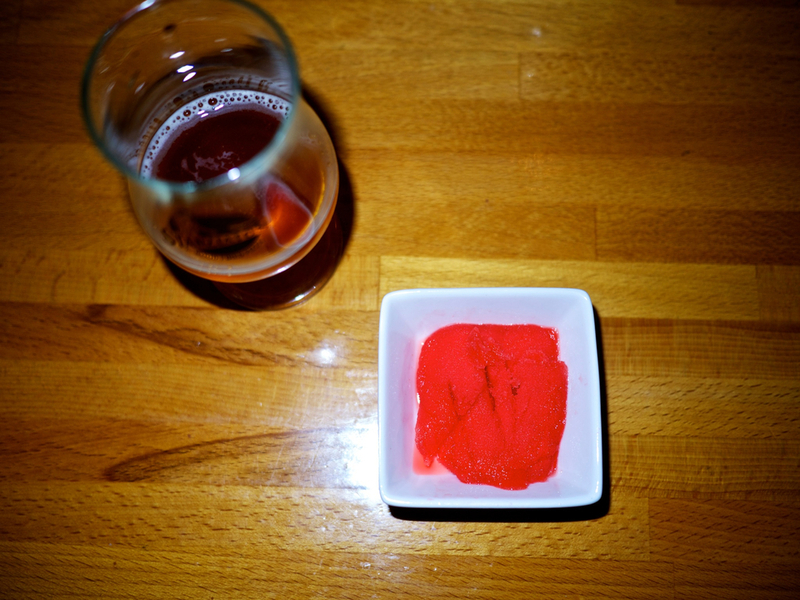 It’s a strong beer and considering the delicateness of the dish, I was a little surprised by the pairing. A pleasant dessert. The crust, as you would imagine, was terrific, and the cheesecake itself was (overused word alert) very light, which I appreciated, considering how much food we’d eaten (and beer we’d drank) by this point. The portions were a bit bizarre; what appeared to be a normal wedge of cheesecake but cut horizontally. We both obviously (because of our back wall of crust) had received a rear half of a slice, which meant, I assume that some folks got just a front triangle. That would have annoyed me. As expected, the Rasputin was just ridiculous—heavy and rich and creamy. 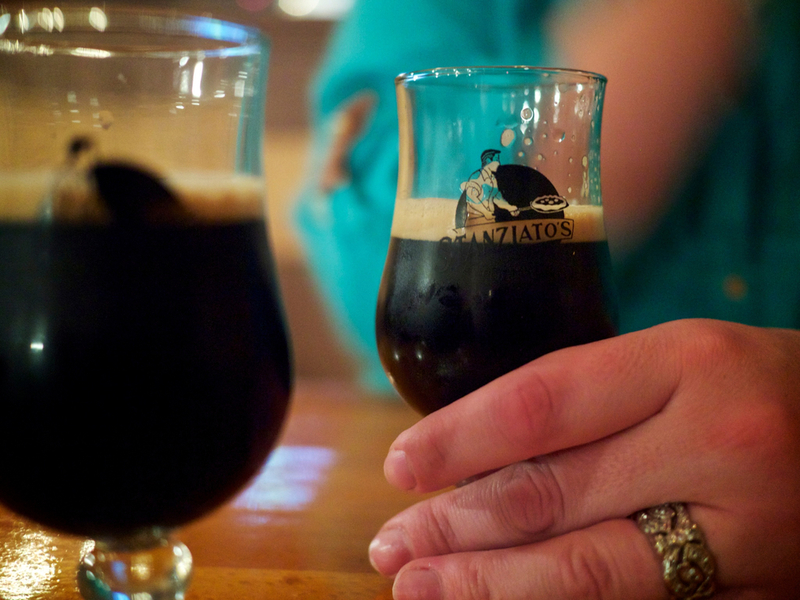 It’s almost unrecognizable as beer. Danielle had three glasses. When you move from one of the culinary centers of the world to a town in Connecticut with a population of 13,000, there are tradeoffs. You know that going in. 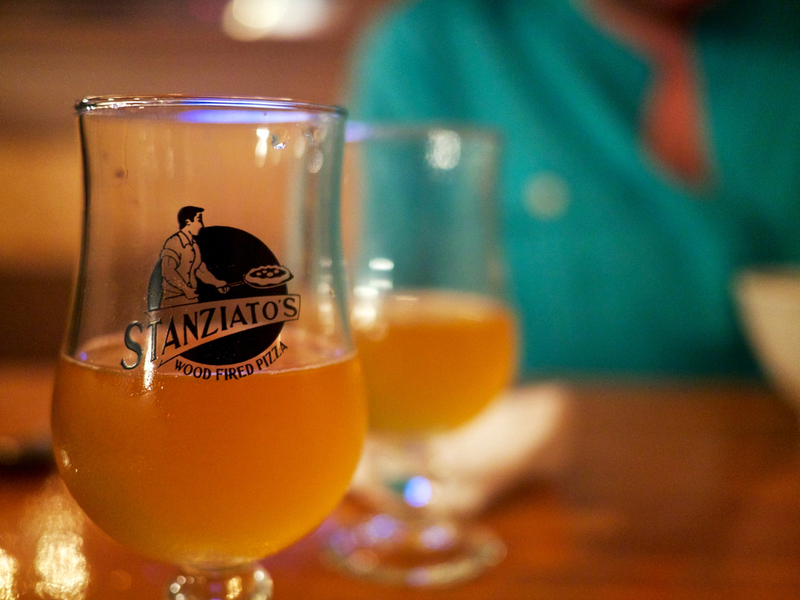 For my wife and I, discovering Stanziato’s eased a lot of the pain. They follow a simple approach: great pizza (and I should note that they have a lot of other great items on their menu, some of which I’ve tried and really enjoyed. One day, once I’m tired of every pie they serve, and the special doesn’t sound appealing, maybe I’ll get around to ordering some of it, but don’t hold your breath), served by friendly people, all in a cozy, artistic, dare I say hipster-y environment (minus any and all pretension, of course) that warms the cockles of your humble reporter’s heart every time he walks in. It’s the very best kind of restaurant; one that feels like home. As a boy from the Bronx, who also spent some time living in Westchester, moving to the woods of Connecticut has been a big change. But a life that isn’t constantly being redefined, or at least rethought, is a life of stagnancy and eventually, diminishment. What we left behind can never be replaced. But the prospect of starting fresh? The results of such a new, outside pressure can't be ignored. 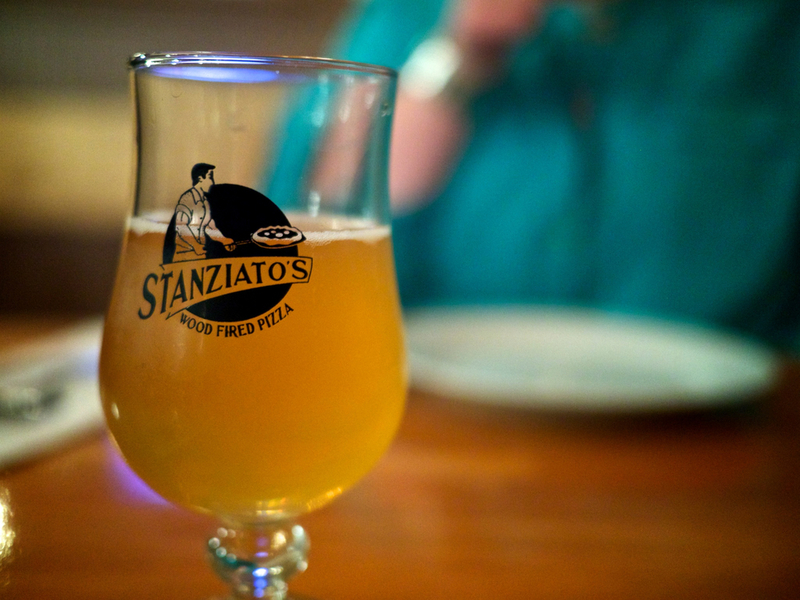 Our third anniversary helped to bring it all into focus, via one beautiful pizza-related lesson: if we hadn’t moved, we never would have had a reason to find Stanziato’s.